It's time again to gear up for Guelph's Kazoo! Fest, and to help you get ready, organizers have now revealed the 2019 lineup. The 12th annual edition of Kazoo! Fest will take place at various locations in Guelph, ON, from April 10 to 14. 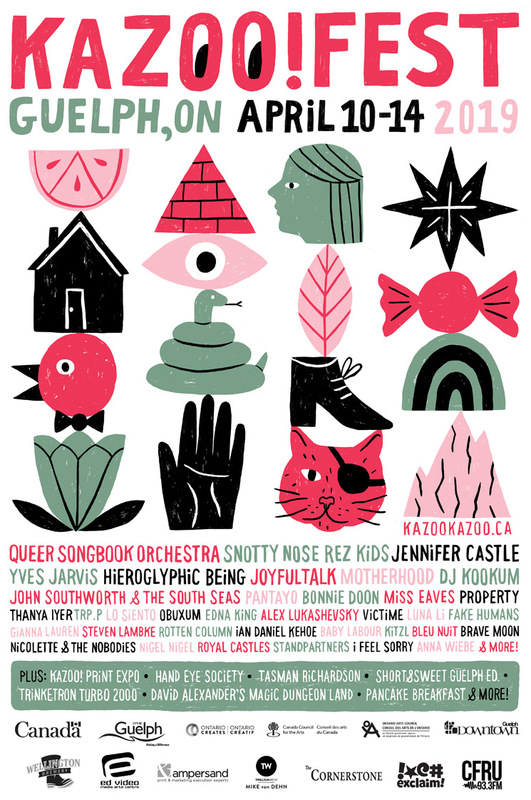 Among the acts topping the bill in 2019 are the Queer Songbook Orchestra, Snotty Nose Rez Kids, Jennifer Castle, Yves Jarvis (f.k.a. Un Blonde) and Hieroglyphic Being. These are artists are followed closely behind by JOYFULTALK, DJ Kookum, Motherhood, John Southworth & the South Seas, Tanya Iyer, Pantayo, TRP.P, Edna King, Bonnie Doon and many more. In addition to more than 40 musical musical performances, the festival will feature visual and media art, contemporary dance, the Kazoo! Print Expo and more. The Kazoo! Crony Pass (festival passes) are on sale now for $75 over here, in addition to tickets for select events that you can grab over here. The full schedule will be announced in the coming weeks. Tickets and more details can be found now at the festival website.